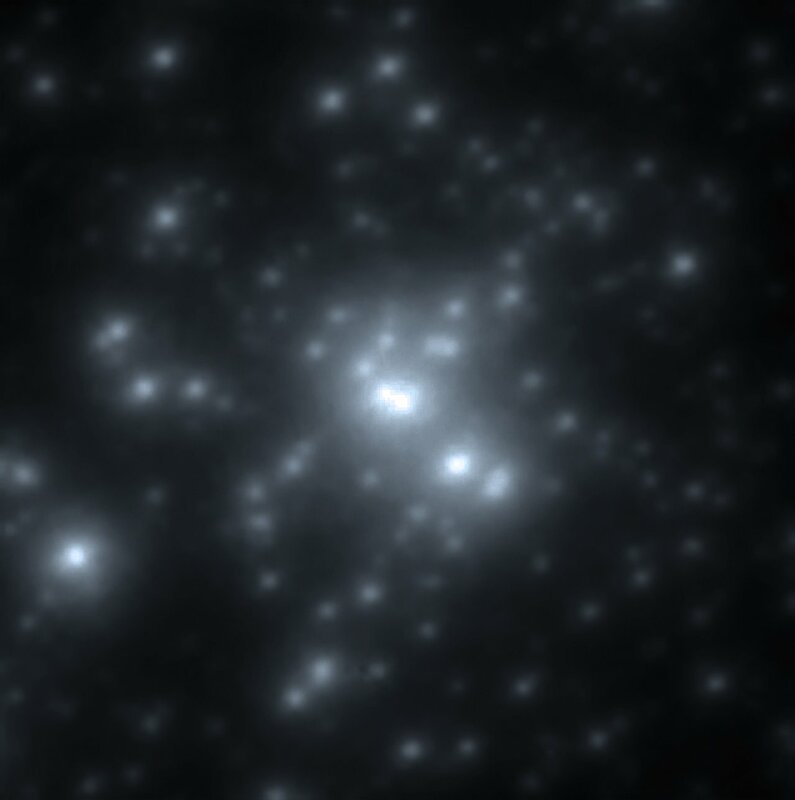 A team of astronomers led by Paul Crowther, Professor of Astrophysics at the University of Sheffield, has used ESO’s Very Large Telescope (VLT), as well as archival data from the NASA/ESA Hubble Space Telescope, to study two young clusters of stars, NGC 3603 and RMC 136a in detail. NGC 3603 is a cosmic factory where stars form frantically from the nebula’s extended clouds of gas and dust, located 22 000 light-years away from the Sun (eso1005). RMC 136a (more often known as R136) is another cluster of young, massive and hot stars, which is located inside the Tarantula Nebula, in one of our neighbouring galaxies, the Large Magellanic Cloud, 165 000 light-years away (eso0613). The team found several stars with surface temperatures over 40 000 degrees, more than seven times hotter than our Sun, and a few tens of times larger and several million times brighter. Comparisons with models imply that several of these stars were born with masses in excess of 150 solar masses. The star R136a1, found in the R136 cluster, is the most massive star ever found, with a current mass of about 265 solar masses and with a birthweight of as much as 320 times that of the Sun. If R136a1 replaced the Sun in our Solar System, it would outshine the Sun by as much as the Sun currently outshines the full Moon. “Its high mass would reduce the length of the Earth's year to three weeks, and it would bathe the Earth in incredibly intense ultraviolet radiation, rendering life on our planet impossible,” says Raphael Hirschi from Keele University, who belongs to the team. These super heavyweight stars are extremely rare, forming solely within the densest star clusters. Distinguishing the individual stars — which has now been achieved for the first time — requires the exquisite resolving power of the VLT’s infrared instruments . Understanding how high mass stars form is puzzling enough, due to their very short lives and powerful winds, so that the identification of such extreme cases as R136a1 raises the challenge to theorists still further. “Either they were born so big or smaller stars merged together to produce them,” explains Crowther. Stars between about 8 and 150 solar masses explode at the end of their short lives as supernovae, leaving behind exotic remnants, either neutron stars or black holes. Having now established the existence of stars weighing between 150 and 300 solar masses, the astronomers’ findings raise the prospect of the existence of exceptionally bright, “pair instability supernovae” that completely blow themselves apart, failing to leave behind any remnant and dispersing up to ten solar masses of iron into their surroundings. A few candidates for such explosions have already been proposed in recent years. Not only is R136a1 the most massive star ever found, but it also has the highest luminosity too, close to 10 million times greater than the Sun. “Owing to the rarity of these monsters, I think it is unlikely that this new record will be broken any time soon,” concludes Crowther. The star A1 in NGC 3603 is a double star, with an orbital period of 3.77 days. The two stars in the system have, respectively, 120 and 92 times the mass of the Sun, which means that they have formed as stars weighing, respectively, 148 and 106 solar masses. The team used the SINFONI, ISAAC and MAD instruments, all attached to ESO’s Very Large Telescope at Paranal, Chile. (note added on 26 July 2010) The "bigger" in the title does not imply that these stars are the biggest observed. 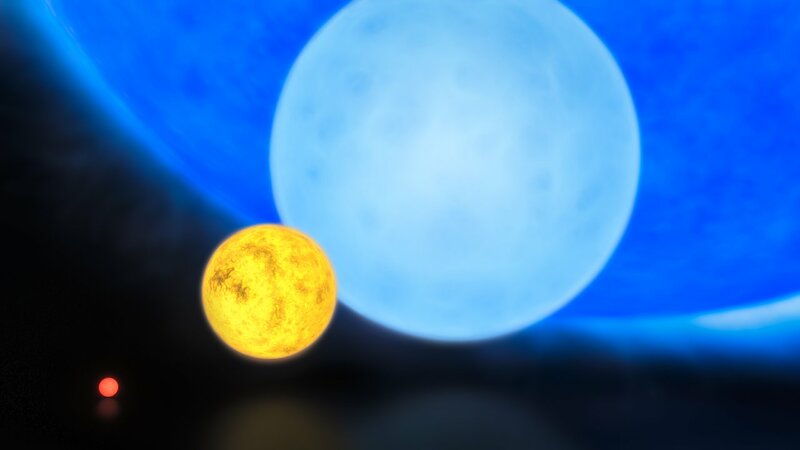 Such stars, called red supergiants, can have radii up to about a thousand solar radii, while R136a1, which is blue, is about 35 times as large as the Sun. However, R136a1 is the star with the greatest mass known to date. This work is presented in an article published in the Monthly Notices of the Royal Astronomical Society (“The R136 star cluster hosts several stars whose individual masses greatly exceed the accepted 150 Msun stellar mass limit”, by P. Crowther et al.). The team is composed of Paul A. Crowther, Richard J. Parker, and Simon P. Goodwin (University of Sheffield, UK), Olivier Schnurr (University of Sheffield and Astrophysikalisches Institut Potsdam, Germany), Raphael Hirschi (Keele University, UK), and Norhasliza Yusof and Hasan Abu Kassim (University of Malaya, Malaysia).